Wow... What a great book. I had never heard about this story before and I was really happy I picked it up. 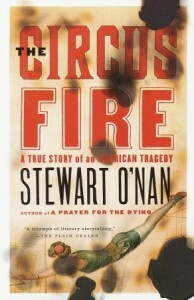 Now I want to read about other circus stories!. O'Nan does an excellent job of setting the story, telling what happened, and then mopping it up afterwards. The only reason is it didn't get five stars is that there were too many people to keep track of. I wish O'Nan had put a little more effort in to telling the reader who so and so is again instead of the reader having to remember as there are a lot of details in this book.